Matt and his family have moved to Nevada, where his mother runs an Army base and heads up their K-9 Training Unit. His father is deployed, so settling in has been difficult. Matt loves extreme sports like kayaking, but they are hard to do alone. When he gets to attempt a rock climbing wall at school, he does better than he expected, and he is invited by some fellow students, including Dev and Amaiya, to try climbing some rocks. This doesn't go quite as well, but he makes some friends and is glad to have a new activity to perfect. 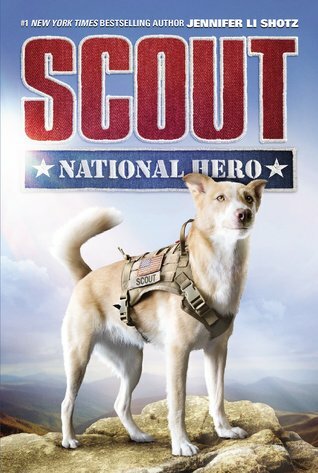 Things are good at home as well, since the family has Scout, a dog who was trained in Mississippi with Hero. Scout's a good dog, and Matt is enjoying him as a pet, but his mother has concerns that he isn't settled and focused enough to become a good rescue dog. When Matt is off on an adventure, there is a disaster that happens with an overflowing damn, and Scout is able to prove his worth. Strengths: Shotz is the best dog adventure writer since Jim Kjelgaard. I have a reluctant reader who was particularly enthralled with her books, and while reading this, it occurred to me that this student might well grow up to join the Marines and train dogs at Quantico! (Our 8th graders frequently visit there on their D.C. trip to see a demonstration of this.) These books are short, action-packed, and featuring engaging dogs and humans. The inclusion of extreme sports in this made it stand out from the others. The cover! A lot of students will pick this up! Weaknesses: I was concerned that this would be Hero retold, but the changes in setting and the inclusion of the military family and extreme sports really made it fresh. What I really think: Can't wait until September 4, 2018 for the sequel!